A single mother who is a domestic violence survivor and Navy veteran was left in tears after she was pulled over by cops. Brittany Payne, from Bremerton, Washington, was driving to a local grocery store with her 15-month-old son, Colton, to buy some milk. When she was on her way back home, she noticed a police car flashing lights right behind her. Payne was unsure why the officer had stopped her, as she had her seat belt on and wasn’t speeding. Police Officer Steven Forbragd, who pulled over Payne, told her she was driving the car without front license plates on it. However, the entire incident evolved into one beautiful act of kindness, which touched Payne’s heart. Later on, she shared the encounter on her Facebook page. “She was almost in tears right away, pretty much. She said she’s a single mom and she didn’t have the tools to put the plates on,” Forbragd told Q 13 FOX. Moments later, two more officers, Johnny Rivera and Jen Corn, showed up. Surprisingly, they helped secure Payne’s license plates using their tools. “I just thought it was going to be another kick to me and they definitely surprised me,” Payne said. Officer Rivera then turned to his patrol car. “He goes to his car and begins writing something out with my son’s name on it,” Payne wrote. 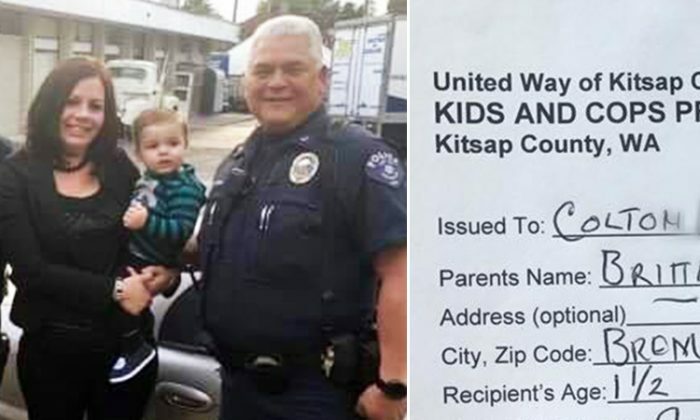 However, instead of a ticket, Officer Rivera handed Payne a US$25 voucher from the United Way for her son’s clothing. “I immediately go into tears from this amazing act of kindness!” Payne wrote. During a short conversation with Officer Rivera, Payne shared that she has served in the U.S. Navy as a gunner’s mate. The officer told her that he’s been a machinist’s mate. Payne shared that she had been “extremely let down by the law enforcement and court system” in her past life situations.